Amplify Shader Editor is a node-based shader creation tool inspired by industry leading editors. An open and tightly integrated solution, it provides a familiar and consistent development environment that seamlessly blends with Unitys UI conventions and Shader use. AAA quality and flexibility at an indie affordable cost with the responsive customer support and short iteration times that you can always expect from Amplify Creations. Not all features are available during the BETA period. While in BETA 1 you can create and extend Surface Shaders, upcoming versions will include dozens of additional shader types, custom lighting models and extended options to help unleash your creativity while adapting to your production’s technical specifications. The price will increase with every major BETA update, buy it now at a reduced price and help shape the editor to your needs! Focused on UX, the workspace is intuitive and familiar, clean, and flexible. Dock it, or use it in a second monitor, its prepared to fit your layout requirements. Fully customizable, it includes full source code and its open to user submissions. Nodes, improvements, fixes, or even plugins, your contribution and feedback is very valuable to us. ASE has a varied and growing node library. In addition to common nodes, it also includes several dedicated composite nodes. Its a great way to easily achieve complex operations using less nodes. The node collection will continue to grow, more complex and advanced will be added in upcoming BETA updates. A full Node list is available in the Manual Page. Help us shape your editor. Thank you all for supporting ASE! In case you missed it, or if you are new to the Amplify Shader Editor, BETA 2 is now available at the Unity Asset Store. As we mentioned in our first post, the price will increase with every major beta update. If you have not already, now is the best time to get it! Among dozens of improvements, the editor is more stable and flexible. It already counts a couple of user created nodes and shader samples. We could not have done it in such a short period of time without your contribution. We welcome your feedback, bug reports, and contributions. Be sure to check our Download Page for the full change list. Lets talk Injection Headers and Alloy Shaders. Most users are not aware that you can take advantage of some Alloy features using Unity surface shaders without needing to convert your shaders manually. Its extremely quick to setup, you could start using the Amplify Shader Editor with Alloy today! [li]In the Project tab, navigate to the “Alloy/Shaders/Unity” folder. [/li][li]Right click on one of the files inside the folder and select “Show in explorer” (or Finder on OSX). [/li][li]In the window, select all the “*.cginc” files, and copy them. [/li][li]Close the window and click back into the Unity editor. [/li][li]In the Project tab, navigate to the folder containing a compatible Unity surface shader. [/li][li]Right click on the shader and select “Show in explorer” (or Finder on OSX. [/li][li]Paste the headers in the same folder as the shader. [/li][li]Close the window, click back into the Unity editor, and wait for the shader to automatically recompile. With these simple steps, your Unity surface shaders, or Amplify Shader Editor surface shaders, can now have Alloy’s area lights, colored light cookies, BRDF, and much more, all thanks to code Injection Headers. NOTE: You will need to repeat these steps every time you download a new version of Alloy. Your materials will be limited to the channels available in the standard surface shader, this will be improved in Stage 2. As the Alloy developer put it, code Injection works because of how Unitys shader system resolves #include directives for handling headers. If you use something like #include myHeader.cginc with just the filename and no path then Unity will first look in the same directory as the shader file, and then search the editors hidden include directory. So basically, if the shader uses an editor header (eg. UnityCG.cginc) you can trick that shader into using a customized local version by copying the header into the same directory as the shader. Then you can simply modify that local copy and the shader will use that instead. This will work for any shader code, even the Standard shader and the generated output of a Unity surface shader. As you may be aware, the Amplify Shader Editor BETA is currently limited to Surface Shaders. Future ASE versions will include several additional shader types, along with better support for custom types, custom shader GUI, and platform specific samples. Alloy is one of the main packages that we intend to support, we will be working close with the developers in order to provide the best experience possible. If you have not already, be sure to check out the latest Amplify Shader Editor BETA. We would also like to take this opportunity to remind you that you can download the latest development build directly from our website. The Amplify Shader Editor is now officially out of BETA. As mentioned earlier, we are going to increase our Asset Store update frequency, you should start to see a noticeable difference in the upcoming days. The package available trough our website will continue to be updated regularly. In addition to the improvements made in the last update, we would also like to take this opportunity to share the new Amplify Products Wiki page. The ASE section is currently the most complete, we will be adding additional information to all other products in the coming weeks. Be sure to check it out for an up-to-date node list, tutorials, a manual, and API Documentation. Would like to know more about developing your own nodes? You can start learning more today by checking out the API Documentation WIP section. Speedup your development with some of the most reliable packages available at the Unity Asset Store. 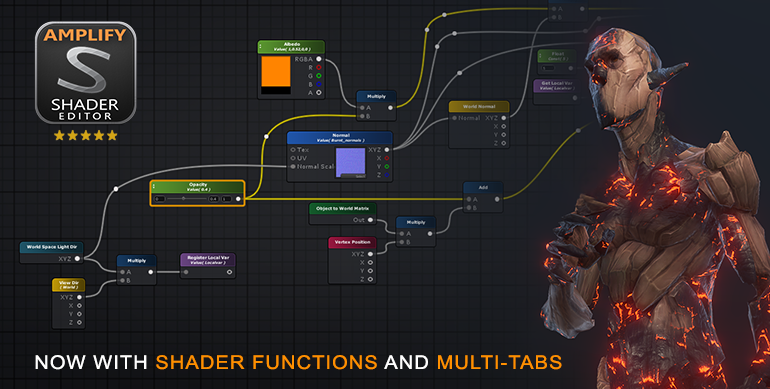 Along with a FREE uFPS and Playmaker license, you can start using the Amplify Shader Editor today. Moving to a Plus Subscription can be a big decision, the Unity Accelerator Pack makes sure that you hit the ground running by offering you 3 top-selling productivity assets. Save up to $190 when you subscribe! What does Firewatch, p.a.m.e.l.a., Manifold Garden, Rust, The Forest, Night In The Woods, Broforce, Ghost of a tale and Star Wars Journeys Ep 1  to name a few  have in common? Check out our full suite of Amplify Unity Products and find out what they can do for your project. Looking for flexible high-quality asset packs? Check out the Old Town package by PolyPixel, it includes ASE compatible shaders that you can customize to your own requirements. If you are not familiar with their work, be sure to check it out! Introducing the Dynamic Nature Pack by Nature Manufacture, an awesome example of what you can build with ASE. If you are not familiar with their work, we strongly recommend that you check it out. Awesome VR Hands & FP Arms Pack by Nature Manufacture, another cool example of what you can build with ASE. Currently on sale! New Amplify Shader Editor update. Check out the new Object Smear sample! If you missed our latest posts, or if you don’t use our own download system, you can now pick up the latest version directly from the Unity Asset Store. Among many improvements and additions such as Shader Functions and Multi-Tab support, we also took this opportunity to set the final price for version 1. Be sure to check the release notes for a complete list of changes. Happy to announce a new update, now with support for Custom Lighting. Be sure to check the release notes for a complete list of changes.